I’ve been anticipating this book for awhile now (after reading that synopsis… how could I help myself?)! I couldn’t wait to embark on the drama. Their passion will consume everything—and everyone— in its path…. I wasn’t sure what kind of drama… exactly, but I had an idea, and considering some of my favorite Megan Hart books, I knew a title like that would have a very good chance of delivering as promised. And for a good portion of it, I was right back in Megan’s “world”. Her brilliant writing and tone, perfectly recognizable. Gorgeous, descriptive writing, with a somewhat darker, more sedate feel. Real, flawed “heroines” (at times, relatable, sometimes not so much) but no matter what, we’ve been in “their” heads before. We recognize ourselves in them. Their thoughts, insecurities and the actions they take, are on some level, familiar. And in turn, we connect and internalize the story as our own. And surprise! 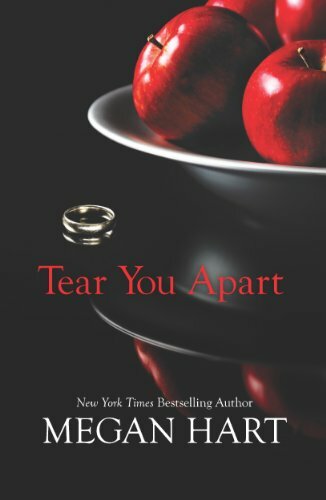 The subject matter in this book, (a flawed and potentially destructive “love story”) revealed itself along the lines of recent books I reviewed: Arsen, Nocturne, Love Square, and now “Tear You Apart”. I seem to be having a theme month in regards to this kind of relationship upheaval. And lemme tell ya. I could really use a more traditional romance book right now. 😉 Mind you, I kind of knew what I was getting into with that synopsis, and Megan Hart does warn us that this is not a romance. But then again, are any of her books really… romance? Love stories, yes! Romance, er… not quite. But considering how a few of her books have shocked me, made me cry, and/or swoon, I was anticipating feeling a deep, personal connection and concern for the characters in this one. I wanted to be consumed with it. I wanted it to take me over, emotionally. Unfortunately, it didn’t. I didn’t fall in love with… any of them. While I was hoping for a certain outcome, I didn’t find myself wholeheartedly rooting for it. Something was holding me back. Keeping me from completely letting go. I used to greet my husband at the door every night, no matter what time he got home. I’d wait for him if he was late. I never wrapped my naked body in cling film or had a martini in my hand, and there were days when the smile on my face was definitely forced… but I always met him. I don’t meet him anymore. That’s when I stopped meeting Ross at the door. Because on the days when he got home first, he never met me. I never came home to dinner waiting for me, or the laundry folded, or a glass of wine. … she now prefers her time alone. Ross has been emotionally distant for what seems like forever. Inattentive. Takes her for granted. The typical stuff. I don’t remember the first day I resented this. I don’t remember wondering why all the years I’d made the effort were not reciprocated. He smiles. I’ve said the right thing. This is it, I think, when he takes my hand and tugs me a step closer. This is when he kisses me. Of course, he doesn’t Why should he? We’ve only just met. I’m no cover model. I’m bedraggled and unkempt and old enough to know better. His fingers stroke my wedding band. And she can’t help but get swept up in him. Her life takes on a new brilliance. I want to be surprised. I want to find something new. I want this to feel different. This is her story. One where she feels she’s coming to life again, but now has to decide where to take it. Because what she thinks she wants, and what she feels she must do, are two very different things. It’s good, but I found myself reading on the outside, looking in. Sure… I felt some of it. I couldn’t help but tsk at her decisions, and acknowledged her own *slight* downward spiral, but I was never emotionally distraught, worried, or even all that incensed over any of it. And I should have been. I recognized the moral issues and the potential for her own self-destruction, and that of everyone around her. I resented her husband’s lackadaisical attitude towards her (ugh!) and could see where she was coming from. I felt her “newfound glory”. But something that could have been so tumultuous (or euphoric) was, for me, just… *shrug*. I didn’t want to just feel it. I wanted to internalize it. Experience it. Agonize over it. And possibly delight in it’s outcome… whatever outcome that may be (after all, one of my favorites of this genre took an unexpected turn in the end, and I ended up loving it). Unfortunately, this one didn’t take me there. Mind you… I barely put it down. It held me enough to read it straight through, but I suspect I did so, anticipating that moment where my heart would be ripped out and I would come out of this read, gushing. But… it didn’t tear me apart. 3 stars for the story overall, but 5 stars for the writing. The author’s writing is so illustrative, in fact, that at one point I noted “she thinks in colors and scents and flavors… it’s weird. And kind of pretty”. And as with all of this author’s unique characters, the reasoning for this comes to light, and I really loved where she took it. Her descriptive writing truly brings them to life. While I didn’t feel the book like I wanted to… I did have moments where I felt sorry for her. I found she was deluding herself on a specific point. It seemed she was convinced she knew the reason for a certain character’s actions. Perhaps the author intended her “reasoning” (his excuses) to be reality. But to me, I couldn’t connect to him, on that level, and I so wanted to tell her. It all just came off as a bit sad, but I suppose this was her lesson to learn, life to live, and growth to achieve. Thank you to the publisher for sending me this review copy. Ooh, I’ve been wanting to read this, but I’ve been having a hard time getting into a new book after reading recent angst ridden roller coaster of a similar theme book. Right!!! I can’t help but wonder if the extreme emotion I got out of that “one“, is putting a damper on similarly themes books. 😉 Like this one. I’m reading Into the Darkest Corner by Elizabeth Raynes right now and it has given me chills three times now! Its scaring me more than I thought it would! Megan Hart is such a compelling writer and I’m a big fan of her books. Dirty being one of my all-time favorites, but that book (the one that will remain nameless) just came out of nowhere that I’m a little biased. I will just give it some time, great review though. This was a first Megan Hart book for me, and I will probably read others by her in the future. While I didn’t find it angsty (um, that would be reserved for Arsen, The Opportunist and Avoiding Commitment, thankyouverymuch! ), it was pretty emotion inducing at times. At the end I just felt kind of sad. It was a good read, but I’m still on the fence about it. Maybe it’s just that I’m still recovering after Arsen. 😉 Alright, time to get my Daemon fix! I AGREE WITH EVERYTHING YOU SAID MARYSE, GREAT REVIEW. THANKS FOR RECOMMENDING THE BOOK ONCE AGAIN.I FELT THE SAME WAY …COULDN’T PUT IT DOWN, BUT DIDN’T FALL IN LOVE WITH THEM EITHER. MAYBE BECAUSE AS INTENSE AS THEY WERE, THEY *** …A MISTAKE THAT MOST MAKE. Hi I was wondering if “Tear you apart” is in continuation of “The space between us”? Hello, I found your review on a Google search and totally agree with it. I was unable to connect in the end and felt like I was an outside observer, rather than my usual emotional investment with the characters I support. However, I was still incensed over the whole affair Elisabeth kept pursuing, and even more so bc she never felt guilty or apologetic for it in regards to her vows and husband. I guess I was mostly reluctant to root for what the heroine wanted (Will) bc I didn’t feel like she ever really fought for her marriage at all before throwing in the towel. She never actually tells her husband straight up what she’s dissatisfied with and how it’s affecting their marriage, diminishing her love for him and desire to remain in her marriage. From what I read, it seemed as though she always dealt with Ross in a non direct way (not telling him she feels he doesn’t appreciate her and her efforts, he’s not supportive, and he doesn’t spend enough time with her–reinforcing their relationship between each other). And after 22 years of marriage (any amount of time in a marriage, really), how can you just walk away from it all without at least attempting to work on fixing it? Her husband seemed mostly oblivious bc she hasn’t really assertively called him out on his BS. I also don’t believe that someone who is a “good husband for the most part” is someone who, in ever scene we see him interact with his wife, effs up in some way shape or form to assholish proportions.